Not quite my life story - but - in 1968, as a young Sergeant, less than a year after I had married Alice, I was posted to Sharjah in what was then the Trucial Oman States and what is now called the United Arab Emirates. This, of course, was typical for the Royal Air Force of that era, getting married almost guaranteed a year's unaccompanied posting, and after five years on V-bombers, what is more logical than a posting to Wessex helicopters? Still, before I left the U.K. I enjoyed several in-depth courses at the Rolls Royce factory at Leavesden on rates and was looking forward to getting to grips with the first attempt at setting-up a Service operated deep-strip facility for the RR Gnome, the miniature gas turbine, two of which powered the Wessex HC2. After all, compared to the RR Conway in the Victor B2R or Bristol Olympus in the Vulcan, the Gnome was nothing. You could almost pick it up and carry it under your arm! At this stage I should mention that this took place before Sharjah had discovered oil, and before the deep water harbour was built in Dubai. Dubai Creek was just that, Sharjah was a small Arab fishing village where the faithful were called to prayer every morning and evening by the strident, amplified chant from the tower of the Mosque and the road to Dubai was a track across the desert. To the uninitiated, the desert was a magical and mystical place, where for a small sum you could be shaved in your bed before waking on a Saturday morning, so well, that you wouldn't need another until Monday. It was, in all respects, a far cry from the air-conditioned luxury and pristine roads full of Range Rovers that exists there today. The work was interesting and the hours were good. Because of the desert heat (100 degrees in the shade - and no shade!) we started at 7a.m. and worked straight through to 1 p.m. Monday to Friday. That was it, the rest of the time was your own. After a few weeks Mick, who had been posted to Sharjah with me, and I started looking around for 'projects' to pass the time when we were not sun-bathing and swimming off the miles of deserted Persian Gulf beaches or spending our money in the local Souks. We had heard that the splendid salads that were served daily in the Sergeants' Mess were grown at an oasis, in the middle of the desert, some miles from the camp. We decided to check it out. The project planning was meticulous and the three of us - we had seconded Bill, a rigger friend, to our party - eventually set out with a map, compass and plenty of water. We walked for a long time and saw absolutely nobody. There was just sand and yet more sand and then, on the point of turning back, we saw our goal shimmering like a mirage on the horizon. We arrived at what can only be described as a wonderful garden. We had been told that all you should do to make the desert bloom was to add water, and here was the proof. The place however, appeared deserted so we wandered around marveling at the quantities of salad stuff and vegetables that were growing. We then discovered the well. Again we had been told that the well was usually attended by a young Arab boy who spent his entire day extracting water with a leather bucket and irrigating the plants, but there was no sign of him as far as we could see. 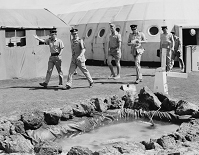 Ascension Island –when it started getting ‘civilised’. Not quite the desert, but close enough! We peered in to the well but could see no water so I picked up a small stone and tossed it down to see how deep it was. Even in the dead, eerie silence of the place, we were surprised to hear nothing. Mick then scouted around, found a larger stone and tossed that after mine. We were all incredulous when we still heard no splash. Bill, however, being of the "if at first you don't succeed, get a bigger hammer" school of riggers said he would soon sort this out. Within a minute or so he struggled back carrying a large log of what looked like the trunk of a palm tree. Without more ado we approached the head of the well and he threw it down. For those of a 'greener & cleaner' nature, and to excuse such an action, I must emphasize that in such a place, at such a time, the politically correct thought of polluting a well was something that did not immediately come to mind. All of a sudden, in this eerily quiet place, events started to rapidly unfold. Almost at the same time as Bill threw the log into the well we heard a frantic scuffling behind us and spun round in unison. There, running straight at us was a small, brown goat. We parted and it tore between Mike and myself, and to our utter astonishment, jumped straight down the well. This was followed some seconds later by two loud splashes, which, although answering the original question concerning the depth of the well, did nothing to abate our growing incredulity. Before we had a chance to discuss these strange goings-on, a scruffy Arab boy appeared and eyed us suspiciously. 'Have you seen my goat, Suh' he asked. Mick was the first to answer, and like the honest, morally upright man he was, truthfully said 'You may not believe us but a short while ago, as we stood here, a small, brown goat ran straight at us, and when we scattered, it jumped straight down the well!' 'Oh no Suh', said the small boy, 'That could not be mine. My goat was securely tethered to a large log of wood'! P.S. Prompted by Chris East's e-mail and looking at the 'new' Entry web site I thought I might offer this for Members' Life Stories. However I find that as I grow older, it becomes more difficult to distinguish fact from the fiction. Now, reading through what I and others have written about our lives I just wonder that, if fiction is influencing my facts now, will I ever go in the opposite direction like my friend Ross Skelton and, in the future, get to compile an encyclopaedia of psychoanalysis? And later become a senior lecturer in philosophy and logic? Perhaps not. Nice one anyway Ross. I always knew, after finding you reading T.E Lawrence's Seven Pillars of Wisdom in the drying room one Saturday afternoon, you would go far.